How Many Hours Does One Spend on Homework in a Part-time MBA Program? Before I started the MBA, I talked to some alumni about what the program entailed. And one of the things that came up in these conversations was the amount of time they spent on homework. Most people estimated it to be around 15-20 hrs per week (remember, this is on top of a full-time job). Naturally, once I started the program, I wanted to see how I compared to this. So I’ve been tracking my time using a little program called “Time Edition”1, which is basically a stop watch where you can associate specific projects with the time and it keeps track of it all for you in a handy dandy database2. Specifically, I’ve been tracking time spent in class and time spent on homework (e.g., solo studying and assignment writing, writing take home exams, group meetings and study groups). And, naturally, you are dying to know my results3, yes? So, I figure this is pretty interesting, right? My amount of time spent is in-line with the 15-20 hours per week, assuming that the people I talked to were including in-class hours in that number, which, to be honest, I can’t remember if they were. I have vague recollections of some people saying that it was 15-20 hours of homework per week in addition to class time and others saying it was 15-20 hours including class time – but it all seems so long ago now5, it’s hard to remember! At any rate, it means that doing the part-time MBA program is really like having a 0.5 job on top of my full time job. 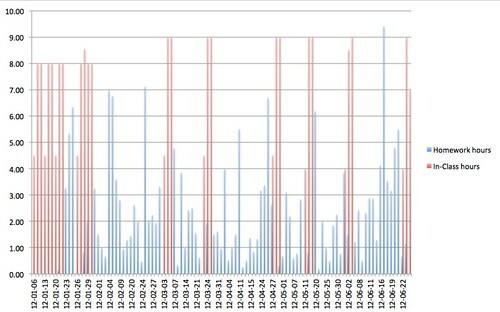 The red bars represent time spent in class, which you can see occurs roughly every third weekend, with a big cluster at the beginning when I had pre-core classes for the first three weekends in January. Blue bars represent time spent doing homework, which you can see varies a lot from day-to-day. So, at this point, I think that the amount of time, which kind of insane, has been well worth it, given how much I’ve gotten out of it. I have another blog posting brewing in my brain about all the stuff I’ve been learning, but I shall have to leave that for another day!